some free time to visit the town and shop for souvenirs. 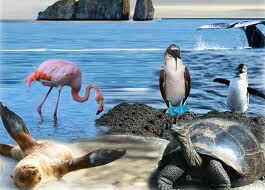 Galapagos Hawk, Galapagos Snake, rice rats, a variety of finches and one of the four species of Galapagos mockingbirds. Deep-water snorkeling. 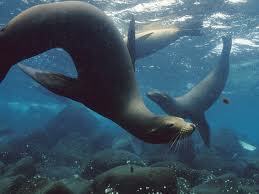 its highest point, be on the lookout for tropicbirds and a bachelor sea lion colony. 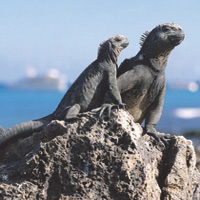 In South Plaza there is a large colony of the smaller sized land iguanas. The population is approximately 300 individuals. They feed on all kinds of vegetation, but during the dry season survive on the fruits and flowers of Opuntia cacti. 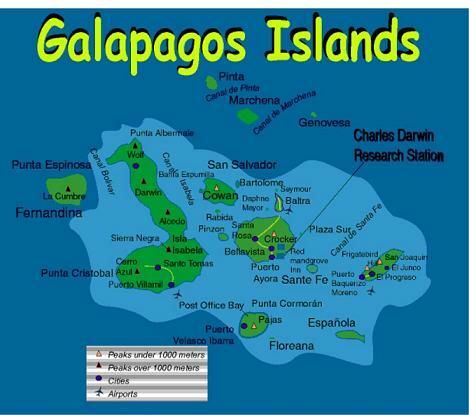 Due to their proximity with marine iguanas, where we will encounter the one and only Galapagos hybrid iguana. will also take a dinghy ride along cliffs to observe nesting seabirds, and snorkel off the coast, where marine life is particularly active. Baltra Airport for return flight to Guayaquil or Quito.